Aww haha we did this with Girls Aloud and Spice girls! Ahhhh I'm going to see them in Liverpool next week! SO EXCITED. I used to be obsessed with them in like junior school, it's fun to re-live your youth now and again! It must have been so exciting!! Can you believe I'm in my thirties and have never been to a concert?!? Wooooo sounds amazing! 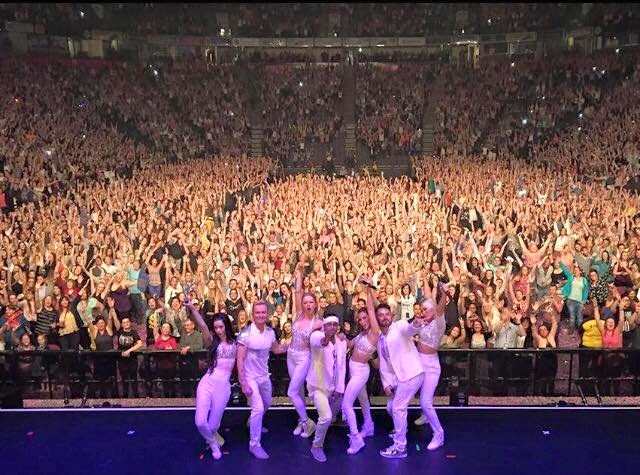 I love going to concerts and gigs - when Steps reunited I saw them twice and three times in total. Slightly obsessed. S Club were at my Freshers ball as well! Love a little bit of nostalgia! Maybe we should go to a gig when you're next in London! Ohhh...I hate to admit how jealous I am...but I am SO envious!! So jealous! Wish I'd bought tickets! I used to have the biggest crush on Bradley as a child hahaha! You definitely need to go to more concerts!